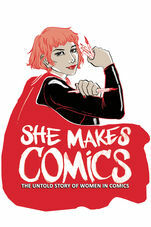 Sequart Organization and Respect Films are proud to announce that She Makes Comics is now available on iTunes, Amazon VOD, and cable VOD. The documentary has received rave reviews and won Best Documentary at the 2015 Comic-Con International. · Neil Gaiman: Dream Dangerously is available on Vimeo and Starz. · The Image Revolution is available on Amazon Prime Video (and on DVD). · Grant Morrison: Talking with Gods and Warren Ellis: Captured Ghosts are available on Sequart’s own online store. · Chris Claremont’s X-Men will be released by XLRator in the fall.